Talk about politaclly and morrally incorrect. In the 70s if you could teach kids the wrongness of smoking from an early age, then rot their teeth at the same time! today they are known as candy sticks, which keeps everyone happy and means the red tip is no longer needed on the end of the stick. The hook wasn’t nicotine, but the set of 40 to 50 cards to collect. There were loads of weird looking animals like some set of drawings from Ricky Gervais’ Flanimals. They were called Animals of Secret Island and were availble in 1975 onwards. 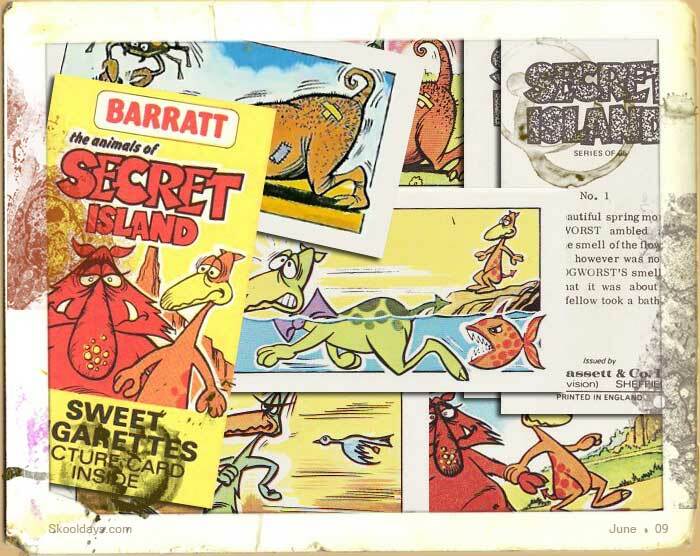 They were the same size as Brooke Bond tea cards and were aimed at younger children, surrounded the antics of the inhabitants of a secret monster island. Follow the exploits of Dinosaurs Dippydactus & Babydactus and their friends, Hector the Frog, Maxwell the Spider and the Glumph. Very weird and difficult to understand why Bassett produced such weird combinations. Apparently the range of cards were so successful that a competition was held for children to design their own monsters to appear in Series Two – however the second set was a real mistake, relying on the original children’s drawings rather than adapting them in the same style, producing a set of scrap drawings from 3 year old, as they were just that. This entry was posted in Cartoon, LunchBox and tagged 1960, 1970 by Skooldays. Bookmark the permalink. I can remember an even more realistic form of sweet cigarettes. The candy was a brown chocolate like concoction. Each stick was wrapped in rice paper and the box was done in a decent imitation of a Winston soft pack.